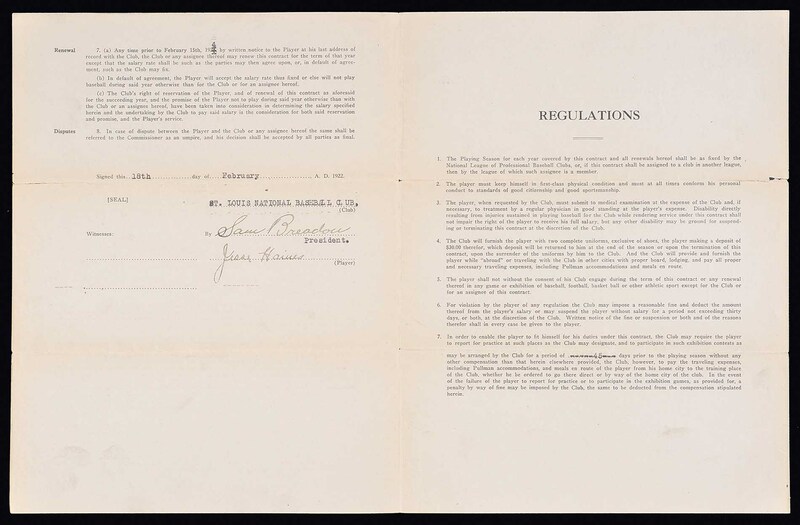 Four-page fold-over contract, dated February 18, 1923, between Jesse Haines and the St. Louis National Baseball Club, signed in black fountain pen by "Jessie Haines" (grading "8") and Cardinals president "Sam Breadon" ("9"). 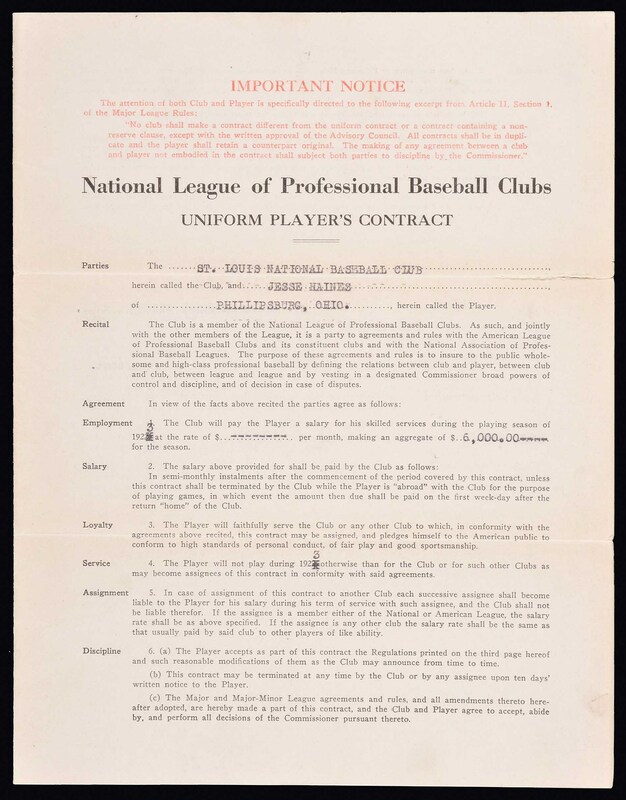 The stamped signature of National League president John Heydler also appears on the contract. The one-year agreement, for the 1923 season, calls for Haines to receive a salary of $6,000. Haines enjoyed his first 20-win season in 1923, compiling a record of 20-13 and a 3.11 ERA. For the next eight seasons Haines was one of the Cardinals' most reliable starters, winning twenty or more games two more times and leading the club to four pennants and two World Championships. He retired in 1937 with 210 wins and a 3.64 ERA. He was elected to the Hall of Fame in 1970. This is just the second Haines contract we have ever offered and it also represents one of the earliest, as we have only seen two that predate it (1920 and 1921). The contract (8.5 x 11 inches) displays two horizontal folds and small tears along the ends of the uppermost folds; otherwise it remains in Excellent condition overall. Pre-certified by Steve Grad and Brian Sobrero/Beckett Authentication Services. Auction LOA from James Spence/JSA. Reserve $1,000. Estimate (open).